A few years ago my Mum gave me her mother’s scone recipe, and now it’s the only one I ever use. These scones are just so simple and easy to get right. There’s no rubbing butter and flour together and no surprising secret ingredient. The only thing I would say is your oven has to be nice and hot, so if yours tends to be on the cool side, maybe consider putting it up 5-10 degrees for this recipe. Scones are a wonderful option for large group catering because they make people feel special but aren’t too labour intensive. These ones won’t cost you more than a couple of dollars or much energy in the kitchen. This recipe makes 20. 2. Place flour, sifted icing sugar and salt in a large mixing bowl. Mix well. 3. Melt butter in a heatproof jug in the microwave, top up the butter with milk to the 2 cups mark on the jug. 4. Make a well in the flour mixture, add the milk/butter mixture and gently combine using a butter knife. Combine using cutting actions through the middle and scraping the outside mixture to the centre. Don’t over mix, you want everything only just combined. 5. Tip the mixture onto a floured bench top and put more flour on the top of the mound of mixture. Pat the whole thing down until it’s about 4cm thick and evenly spread out. 6. Cut rounds using a floured scone cutter or an appropriate sized glass. 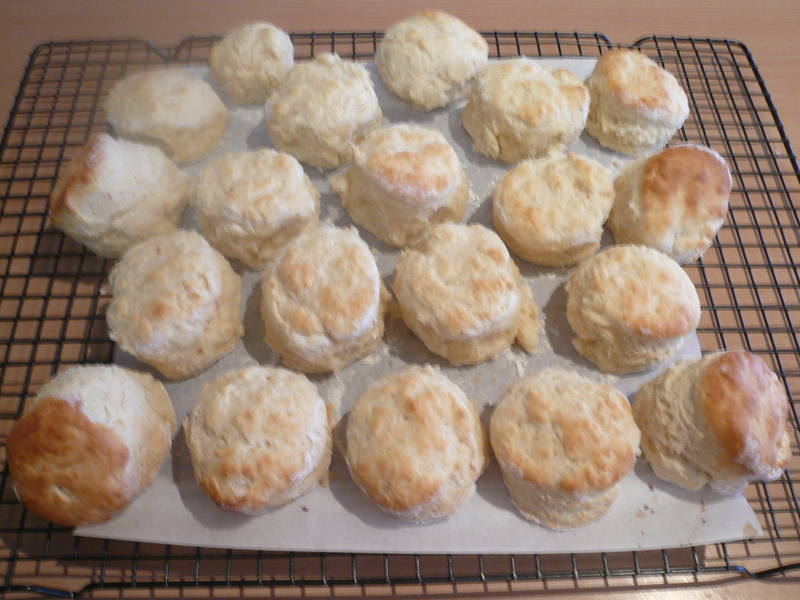 Place each one on a biscuit tray lined with baking powder so that they are close together but not touching. Brush the top of each scone with a little milk. 7. Bake for around 10 mins until they’ve risen and are golden brown. 8. Serve with jam and cream. I am interested who has posted this as my maiden name was Fragar. I live in Australia near Newcastle. Hi there. Margerie Fragar was my grandmother who passed away in 1998. I am the daughter of her seventh child, Ella (Glenda). Hi again, I left a reply a while ago but it seems to have gone missing. Thank you for your reply. I am a cousin of Neville’s and saw your mother at the reunion on 27/10.